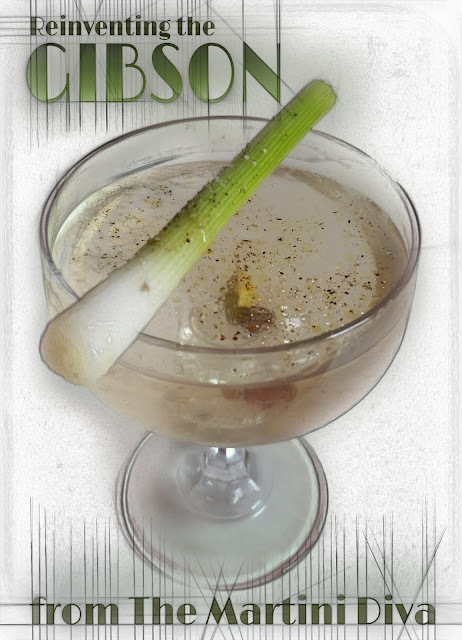 The Gibson is a classic, old school cocktail that is a variation on the Gin Martini where the olive or lemon twist is replaced with a cocktail onion. Interestingly, according to the oldest published recipe for the Gibson in the 1908 book, "The World's Drinks And How To Mix Them" by William Boothby, a Gibson is equal parts gin and French vermouth stirred with ice and strained into a cocktail glass and sometimes served with an olive. Except for the ratios, this sounds suspiciously close to a typical gin martini to me. As you can see, no cocktail onion was on the team. When the cocktail onion came into play is as heavily debated as who created the Gibson in the first place, and frankly, m'dears, I don't give a hoot. 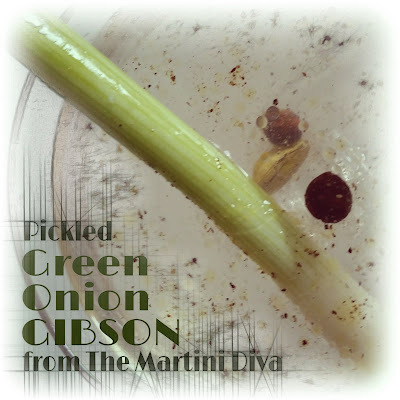 The Gibson, as we know it today, is garnished with a cocktail onion (though usually one of those ubiquitous, soggy little orbs of a sad excuse for a vegetable) and that's it's iconic signature garnish! At this point I'm sure you all know how I feel about bottled, canned and mass manufactured ingredients in my cocktails. I avoid them like the plague and upgrade them with a fresh, homemade, nutrient and flavor packed alternative wherever possible. In the case of the cocktail onion, it's very possible and extremely easy with a quick pickled fresh green onion, and, yes, I've provided you with my personal recipe for Quick Pickled Green Onions below. So, instead of a mushy and tough excuse of a pearl onion you get a crunchy and savory bite of zing at the end of your Gibson! INSTRUCTIONS: At least an hour or two ahead of time pickle your green onions. (Recipe below.) Chill your cocktail glass in the freezer or fill with ice to chill. Fill your cocktail pitcher with ice, add the vermouth and stir a few times. Add the gin and stir for about 12 seconds then stain into your chilled glass. Garnish with a Quick Pickled Green Onion, a few of the juniper, coriander and cardamom seeds from the pickling liquid, add a dash of salt and pepper then serve. Yes, you will see a few drops of the olive oil floating in your cocktail as a result of the pickling liquid from the onions and the spice seeds. Believe it or not, the olive oil acted like a secondary garnish bringing tiny bursts of the vinaigrette on the palate, a nice little surprise! DIRECTIONS: Crush your seeds lightly, just to open them up. Heat everything but the green onions in the microwave for one minute. Pour the warm pickling liquid over the onions and allow to cool. Refrigerate for a few hours until it's cocktail time! 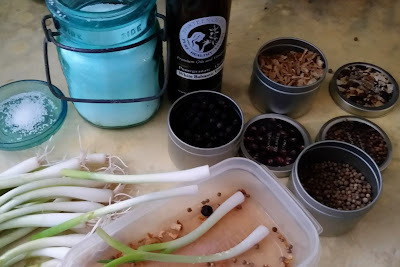 The pickling spices I used, inspired by the botanicals used in the Ford's Gin, give the onion a nice tiny kick of juniper, coriander and lemon when eaten, like a last goodnight kiss.